Devon Skeats explained it best. The fourth-year power forward recorded two goals and added an assist Wednesday night in the WLU women’s hockey team’s 4-0 playoff win against their cross town rivals, the Waterloo Warriors. The Hawks took game one of the Ontario University Athletics (OUA) quarterfinal matchup. Laurier played the majority of the game with just seven forwards and two defencemen on the bench and only 14 players in total. Midway through the first period, Waterloo’s Jessica Tracey was given five minutes and a game for a knee-on-knee hit on Laurier’s Candice Styles. Styles did not return to the game. Laurier also lost third-year forward Laura Brooker, who was forced to leave the game with a minor injury. However, despite losing key players early in the game, captain Fiona Lester complimented the team’s ability to play with a short roster. 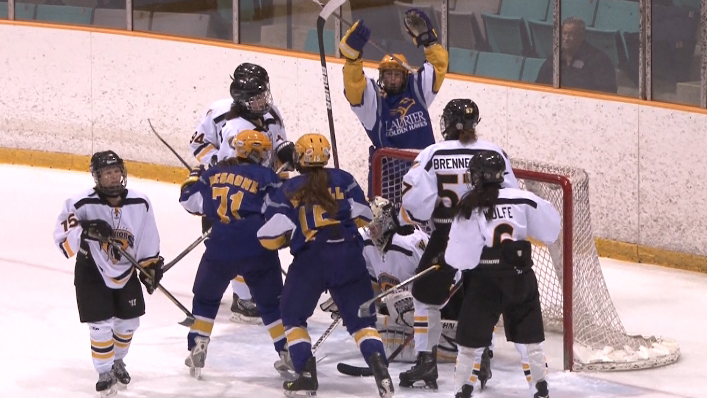 Following a slow first period, the Hawks mustered up a strong offence against the Warriors to go ahead 1-0 in the second period after Tammy Frieburger sent the puck in front of the net, Jessie Hurrell beat Warrior netminder Rebecca Bouwhuis. Despite clearly battling fatigue in the third, the Hawks managed to keep Waterloo off the score sheet. Paula Lagamba widened the lead to two midway through the third period before Skeats beat Bouwhuis twice to put the win away. “We’ve had some slow starts, that’s for sure, it’s nothing new, but [it’s] good that we could rally around the first goal then get some more in the third,” Lester said. After Wednesday’s game, Waterloo has now been unable to score a goal against the Hawks in 308 minutes and six seconds, a span of over five games. However, Waterloo managed to muster up some offence early in the game, putting a few good chances against second-year goaltender Erika Thunder. The quarterfinals will continue Saturday when the Hawks visit Waterloo for game two. The puck drops at 2 p.m. at Columbia Ice Fields.